Attended the circus with friends and survived. Jeannette (St. Onge) Pierre was called home to Heaven on February 18, 2019. Link to obituary / Back-up link,. Attended the circus with her employer, Harry Stone. Both are patients at Hartford Hospital. It was reported that Mrs. Sampson was badly burned. Mrs. Sampson's cousin, Mrs. Mable Staples, was also injured in the fire. Mrs. Sampson's injuries include abrasions resulting from a fall and are of a more serious nature than Mr. Stone's. "Sara" Sampson on the Critical List at Hartford Hospital, 7/10/1944. Attended circus and got out safely. Mrs. Evelyn Sartori, 39, wife of John Sartori, died February 21, 1945 at her home, 37 Florence Street, East Hartford. Was awarded $250 by the arbitration board for injuries received in the fire, including a sprain and contusions to his left foot from when he fell from the stair scaffolding. Grandfather of Katherine Spada Basto who mentioned him at the Circus Fire Memorial Dedication Ceremony. Mr. Saunders went back into the tent and saved countless lives. Went to circus with father Ruby Schaller, younger brother, and neighbor David M. Elovitz. Went to circus with older son Earl, younger son, and with neighbor David M. Elovitz. Went to circus with father Ruby Schaller, older brother Earl, and neighbor David M. Elovitz. Schlank is probably adult married name? Attended the circus with his mother and three other children including his sister Elissa Schoen. Gilbert was able to assist his mother from the folding chairs and they all reached the top of the seats and jumped to safety. Gilbert was uninjured. Attended the circus with her mother and three other children, including her brother Gilbert. The group went to the top of the seats and jumped to safety. Elissa suffered minor burns on her back, was treated at St. Francis Hospital and released. She received $500 in compensation for her injuries. Attended the circus with his sister, Aileen (Schultz) Gallagher and her husband and son. All in the group escaped safely. Read the Gallagher family story here: Personal Accounts Page 7. Nurse at St. Francis Hospital, shown in photo with patients Jackie and Mrs. Czertak. Attended the circus with his sister Dolores and their mother Caroline Sicilia, all of them survived. Attended the circus with her son Alexander and daughter Dolores, all of them survived. Attended the circus with her brother Alexander and their mother Caroline Sicilia, all of them survived. Married name Dolores Sicilia DiFazio. Went to the circus with her brother, Stanley Sigal, and both escaped uninjured. Passed away 2007. Went to the circus with his sister, Irene Frances Sigal, and both escaped uninjured. Passed away 2010. Attended the circus with her son, Joseph, and daughter, Judith. 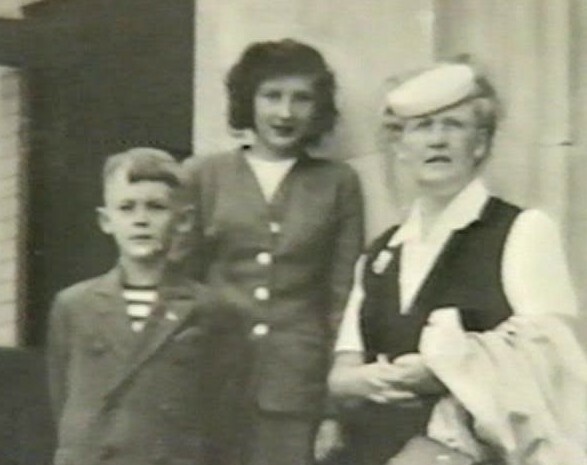 Elliott Smith with his sister & mother. Mr. Smith is interviewed in the documentary film Disasters of the Century: When Laughter Turns to Tears. Attended the circus with his mother Mrs. Edith Smith and his sister, Judith. Joseph escaped without any injuries. Attended the circus with her mother, Mrs. Edith Smith, and her brother, Joseph. Norman went to the circus with a neighbor and her son. He survived the fire with no injuries. Norman helped save a child by handing the boy down to his mother from the top of the bleachers. Mr. Smith passed away April 2, 2010, at age 81. LINK to Mr. Smith's obituary. Was awarded $5,000 by the arbitration board for injuries received in the fire, including contusion of the right ribs, sacro illiac sprain, contusions and sprain of right shoulder blade, contusions and lacerations to body, and nervous shock. Carl, his parents, and brother survived the circus fire. ​Carl J. Sokolowski died December 6, 2018. Link to obituary / Back-up link. Survived the circus fire with her son William and husband David. Another son, David J. Spatcher, Jr., was killed the same week as the circus fire while serving with the U.S. Army Air Force in WWII, Pacific theater. Survived the circus fire with his son William and wife Barbara. Another son, David J. Spatcher, Jr., was killed the same week as the circus fire while serving with the U.S. Army Air Force in WWII, Pacific theater. Bill and his parents were grateful to survive the Hartford Circus Fire in 1944, the same week that his brother David J. Spatcher, Jr., was killed while serving with the U.S. Army Air Force in WWII, Pacific theater. William Spatcher died December 12, 2012. Was awarded $6,000 by the arbitration board for injuries received in the fire, including contusions and sprain to her back, feet, ankle and left hand. Was awarded $1,500 by the arbitration board for injuries received in the fire, including multiple contusions and abrasions, and second degree burns on her left elbow. Was awarded $400 by the arbitration board for injuries received in the fire, including first and second degree burns on her back and upper arms. Shirley was trampled on and received bruises on her legs and body, and suffered from nervous shock. Attended the circus with her cousin Mrs. Sarah Sampson and Mrs. Sampson's employer, Mr. Harry Stone, with whom Mrs. Staples was visiting. Awarded $3,500 by the arbitration board for injuries received in the fire, including severe bruises on legs and body. Was awarded $2,500 by the arbitration board for injuries received in the fire, including pain in her back and shoulders, sprained left ankle, pain in right ankle and all over her body, and a nervous, choking feeling. Was awarded $2,000 by the arbitration board for injuries received in the fire, including a severe laceration on her left leg, a ragged three inch rip that was widely separated, badly contaminated, and bleeding freely. Was visiting her pregnant daughter, Marian Heath, in Hartford. Went to circus alone since her daughter was close to giving birth and her son-in-law was at work. 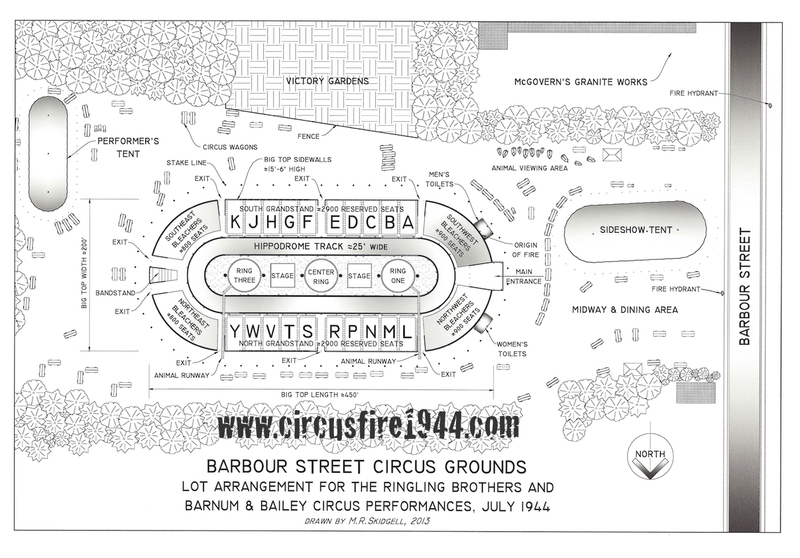 Regina's journal entry for the day: "July 6, 1944 Thurs: Hartford- Ringling Circus fire. Shopped in a.m. for Marian. Went to circus. First act was over at 2:45-Fire broke out not far from me. I was 4 rows down from top-in grandstand. We all surged away from the fire. An overturned chair got caught on my l[eft] leg. I finally got it off. A man helped me jump off the edge of seats. Got over a fence into a veg. garden. Called Marian. Got home about 3 hrs. later. Over 160 killed, 250 injured." Attended the circus with his housekeeper, Mrs. Nellie Sampson. Both are patients at Hartford Hospital. It was reported that the latter was badly burned. Mrs. Sampson's cousin, Mrs. Mable Staples, was also injured in the fire. Mr. Stone's daughter reports that Harry Stone had been burned about the head and shoulders and that the hospital authorities considered his condition as very good. Circus worker, employed by Alfred Court as officer/secretary of the Court Corp. Mr. Storey trains the animals in Mae Kovar's act, and was near the northwest animal runway when the fire began. The animals went quickly through the runway, none were burned and none were fighting. Wilson got the animals on their wagons, concerned about what would happen if they were to get loose, and tried to prevent the fire from reaching the wagons. Attended the circus with her husband Frank, children Dennis and Eileen, Amy and Jerome Montano, Ella Russo and Vincent Testa. All but Vincent would survive. Attended circus, got out safely.